This is from a facebook posting (a friend of a friend). I don't think Trump really understands a lot of what people tell him. "family member in the Corps of Engineers who told me that his boss (the general) had to meet with Trump to talk about plans for the wall. The general tried to explain why Trump's idea for a 30-ft deep trench wouldn't work, but Trump's eyes glazed over. The general then showed him the Corp's initial plan for the wall and Trump said it was ugly. He said he wanted his wall to be beautiful and sketched out what he thought was a beautiful wall: 30 feet high with spikes on the top. I saw a photo of the sketch and all I could think of was Vlad the Impaler. Crazy train!" H/T to Pod Save America for planting this idea in my head. I carry a very strong need for justice, and it would be a travesty of justice for him and his children and co-conspirators to be able to walk away from their crimes, but is that really the worst thing that could happen? I'm beginning to wonder if the best course of action regarding Trump is to just bribe him to leave the office as soon as possible. I'm torn between creating a dangerous precedent versus entering a period of time when he still wields tremendous power but begins to really feel backed into a corner. President Pence, as odious as that sounds, would likely get rid of the tariffs and restore free trade. But what might he do to people's rights that have different POVs on marriage, sexuality, gender, and religion? I know these topics have been used as a boogieman scare tactic by some... What would he be like IRL once he was president? And if you want to know what's going on in opposite world, look at the headlines at Fox news (Cohen get 3 years but also Dershowitz" Trump won't get impeached unless massive new information", "shake down at the border" Migrant caravan are demanding 50K each or they will storm the border, ex NBA player dead, opiod scourge, another NFL player news. That's the breaking news. Nothing to see here. Cohen is in trouble but if you read Fox news, not connected to Trump. Hmm. This article is pretty funny, though not in a good way to republican politicians. In another odd exchange, [R-IA] King quizzed Pichai [Google CEO] on why his 7-year-old granddaughter saw a picture of him with derogatory language pop up on her iPhone while she was playing a game prior to the November election. "Congressman, iPhone is made by a different company," Pichai responded, prompting laughter from some Democrats on the committee. I think Donald Trump is the inevitable conclusion to the baby boomer generation. They inherited a postwar economy unlike anything ever seen before, have amassed more personal wealth than any group of people in history, flagrantly strip mined the planet's resources to make it happen, then blamed their own children for ruining everything by being lazy and entitled. What could be a more fitting capstone to their generation than electing their archetype to the presidency? I'm just quoting this because it's my single favorite paragraph to have ever appeared on this forum. Tip o' the hat to you, sol. It's hard to believe that article is from Fox! It's pretty funny though. Whole clip is fairly factual, but the part from 3:30 on is about as straight forward as it gets. Not only is it surprisingly factual, it's one of the better explanations I've seen from any televised news source. Huh, surprises every day. Shep Smith is a serious journalist and has been telling the truth about Trump on Fox for some time. Other parts of the network, such as Fox and Friends, are carrying on with the lies. I find this fascinating. Will he actually be prosecuted. How are his supporters going to act. This generation was exposed to lead in drinking water, paint, and gasoline. Dunno if this is making much news in the US . . . but Canada recently arrested Meng Wanzhou (a wealthy Chinese executive for Huawei) on a US extradition request. The US says that she has been bypassing sanctions to Iran. The Chinese government says that the charge is BS and related to the US/China trade war thing. So they've started detaining Canadian citizens in China in retaliation. Normally of course, I'd assume that China is lying. But then Trump says that he'll intervene in the extradition if it secures a better trade deal for the US. Which kinda makes it sound an awful lot like the US is actually making the arrest for purely political reasons. WTF America. It has made the news in the US as well. The FBI has already publicly rebuffed the president for attempting to use a criminal investigation as part of a trade negotiation. He doesn't understand that the government doesn't work for him. Of course, this little piece of international news has largely been drowned out by the myriad of criminal charges levied against the president and his cronies in the past two weeks, which clearly document that the president of the united states has committed multiple felonies. At this point, we're still trying to decide if we can indict a criminal who ascends to the presidency, or if winning a national election is like a get out of jail free card for any and all crimes you may have committed in life. On a side note, approximately 30% of the country is still relieved we didn't elect "crooked" Hillary instead. I cannot emphasize enough how well the anti-Hillary thing played out to elect Trump. No matter how bad Trump gets, many people will forever think we avoided the true evil in 2016. I saw that the Weekly Standard will publish its last issue on Monday, 12/17. #nevertrumpers are losing their most reliable publication. It's going to be very hard for a GOP primary challenge against Trump to succeed in 2020. Well, that combined with the GOP making it harder to challenge him in the earliest primaries. This is, of course, the same sort of deck-stacking that Trump accused Democrats of in the 2016 primary. To my knowledge, no elected incumbent president has lost in a primary though several challenges have played over the years, some of which altered the presidential elections (e.g. McCarthy in '68, Buchannan in '92). There is a lot to unpack on this one. The (very extraterritorial) U.S. laws in question re. sanctions against direct and indirect dealing with embargoed countries have been on the books for years and years, but I don't believe there's ever been such a high-profile trade sanctions arrest in Canada. This couldn't have come at a worse time, IMO. Looks like the Canadian government has been played, and we'd be damned no matter what we did. It's not enough that we were bent over backwards on NAFTA, but now we are on shakier ground with China on trade. Could you clarify - "this couldn't have come at a worse time"... for whom? Hmmm ... for a lot of things. Globalism, trade, the economy, international relations, the perpetual negative news cycle, for a start. And for the detainee. I totally get the fact that countries have interests - not principles - but this just seems arbitrary, yet targeted. Thanks for asking, nereo - I'd be interested to hear your take on it all. A dream come true to see all these grifters arrested in the white house, put in handcuffs, thrown in a paddy wagon and off to jail for 20 years. Those shenanigans apparently involve funneling inauguration funds into her own pocket by serving as both an adviser to the campaign and as a representative for the hotel that hosted the events. It's a pretty egregious example of double-dealing for personal profit. I doubt that it's a crime worthy of prison time, but it should definitely get her and the Trump Organization a hefty fine. The whole family has used the presidency as an opportunity to enrich themselves by defrauding the country at every turn. I'm finally regaining the feeling that even if Trump issues some ridiculous pardons and Tweets objections to objectively true reality, that none of it will matter in the world of a declining stock market and global discord. I don't think anyone will willingly line up behind a buffoon when their company is losing money globally and their environment is being polluted with no financial gain. But it's hardly a complete list -- for one, it's missing Scaramucci! I think our government wasn't paying attention. They should have diverted this before it got into the legal system. Either warn Ms Meng (via Huawei Canada) not to come back to Canada, or demonstrate incompetence by arriving to detain her after her flight left. Let the damn yanks do their own dirty work. I'm starting to get the feeling that the liberal government is poorly organized and only capable of responding to very public problems. Better take a second look, he is on the list. Thanks, but it's not my idea. It's already been making the rounds on various media outlets, so I felt pretty safe that I wasn't going to be the one who gave him any new ideas. Seems it's already out of date: Ryan Zinke is stepping down from his post as Sec of Interior amid multiple probes of professional impropriety. 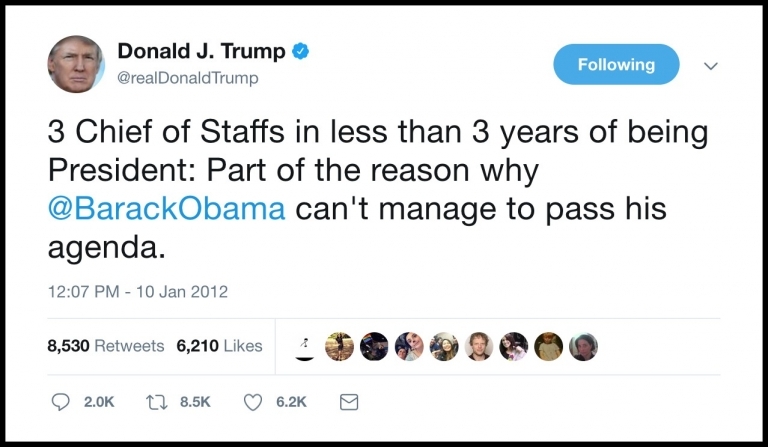 Trump is now on his 3rd Chief of Staff in less than 2 years. Just pure evil. I have been thinking about that scenario and what a perfect end to a depraved Presidency. His middle finger to all and to all a good night! Presidential pardons do not extend to state crimes. No presidential pardon can wipe away investigations by SDNY or potential charges they might file against DJT. It also won/t stop other states' AGs from filing charges should improper or illegal business dealings be uncovered during congressional investigation and/or discovery under the existing emoluments cases moving forward in MD and DC. As Trump has businesses in something like 13 different states his legal exposure is considerable. Unless all of his business dealings have been on the straight-and-level he could face dozens of charges immediately after leaving office, regardless of any hypothetical presidential pardon. The Attorney-General's office says that a sitting President can't be indicted. Contrary to recent reportage, a sitting president can be indicted; no constitutional provision bars indictment of a sitting president. If it were discovered that a sitting president committed a serious crime, and the expiration of the applicable statute of limitations was imminent, and there was no time to toll it, then a sitting president could, and ought to be, indicted to prevent them from escaping justice. My comment above was specifically referencing the hypothetical situation of Trump being pardoned by Pence or whomever replaces him as President. tl;dr: that would not be sufficient to end his legal perils as a bevy of state charges could still be launched. Regarding "can a sitting president be indicted" - that's been one of the great legal parlor discussions since the country was founded, right up there with "can a president pardon himself." Certainly there is precedent for courts preventing more minor lawsuits from progressing under the defense that it would "interfere with the president's unique official duties". Twice the Office of Legal Council has used that argument (once for Nixon, a second time for Clinton) and neither time was it tested in from of the SC court. In Nixon's case he resigned before it could be tested while Clinton relented and sat for a deposition, which satisfied special council Ken Starr. At the time Starr has written a brief arguing why a president was NOT protected from indictment, but it the legal question (and therefore legal precedence) was never ruled upon. Yes, Pence looked like he was clueless. Kind of like grandpa in the easy chair while the children squabbled. Man-prop indeed! Pence is just creepy, IMO. Well we women have massive powers over men, that is why we have been kept down all those millennia, we are so dangerous otherwise. Um, if he cannot be alone in a room with a woman, what is the issue? Is any woman so tempting that he will turn into a ravening monster? Are all women so evil that the woman alone in a room with him will do something monstrous? Like attack him, or accuse him of turning into a ravening monster? Sure, Angela Merkel or Theresa May will do this (not). Seriously, my brain is just not computing this.